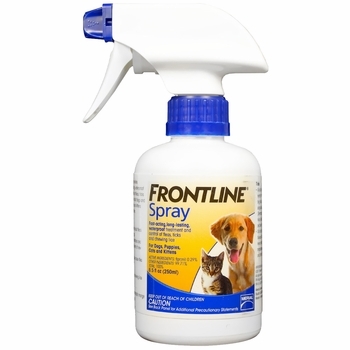 ﻿﻿﻿﻿﻿﻿​FRONTLINE® Spray provides fast-acting, long-lasting, waterproof treatment and control of fleas, ticks and chewing lice for adult dogs and cats and for puppies and kittens 8 weeks of age or older. 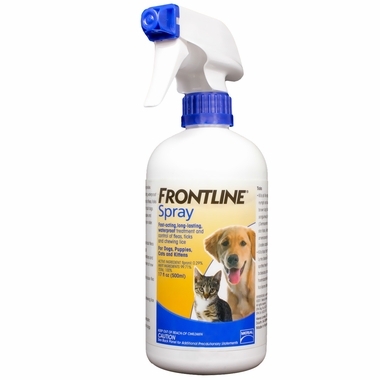 Learn more about Frontline Spray. Kills all life stages of ticks (larva, nymph and adult), including brown dog ticks (Rhipicephalus sanguineus), American dog ticks (Dermacentor variabilis), lone star ticks (Amblyomma americanum) and deer ticks (Ixodes scapularis). FRONTLINE is a registered trademark of Merial. All product and company names are trademarks™ or registered® trademarks of their respective holders. Use of them does not imply any affiliation with or endorsement by them.